Adirondack Cabin Rental. A CNY Vacation at Wellness:te Lodge. Central New York Adirondack Cabin for rent. Private riverfront lodging in CNY. Close to Syracuse, Utica, Rome, Camden, Tug Hill, Adirondacks, NY. is our largest cabin with full amenities. Beautiful cabin rental in Upstate NY near Tug Hill and the Adirondacks- Wellnesste Lodge. Wellnesste Lodge offers 60 acres with 1/2 mile of private river frontage in Central NY. Central NY offers outdoor adventure at Wellnesste Lodge near Onieda Lake, Tug Hill and the Adirondack Mountains. Come enjoy a getaway vacation at Wellnesste Lodge in upstate NY. Close to Oneida Lake, Tug Hill and the Adirondacks. Enjoy your private cabin rental... the Adirondack cabin is perfect for couples, families and groups of friends in all seasons! Full cabin rental in Upstate New York at Wellnesste. Wellnesste Lodge's Adirondack cabin offers all of the comforts of home on 60 private acres with over 1/2 mile of river frontage. Enjoy your cabin rental at Wellnesste Lodge in Central NY. Hiking, Tubing, Skiing, Snowmobiling and more all in Upstate NY close to Wellnesste Lodge. Your private cabin is awaiting your arrival. Relax and enjoy a cozy Wellnesste Lodge vacation. Wellnesste Lodge in Upstate NY is an outdoor paradise. Get back to nature and unwind! Modern amenities in the Adirondack Cabin at Wellnesste Lodge, NY. Wellnesste Lodge offers a variety of comfortable cabin rentals for individuals and groups alike. Come explore Upstate NY with us! Need some rest and relaxation? You've found it at Wellnesste Lodge. The Adirondack cabin at Wellnesste is a perfect vacation cabin rental for couples as well as families and groups. Modern amenities with a beautiful cabin feel at Wellnesste Lodge in Upstate New York. 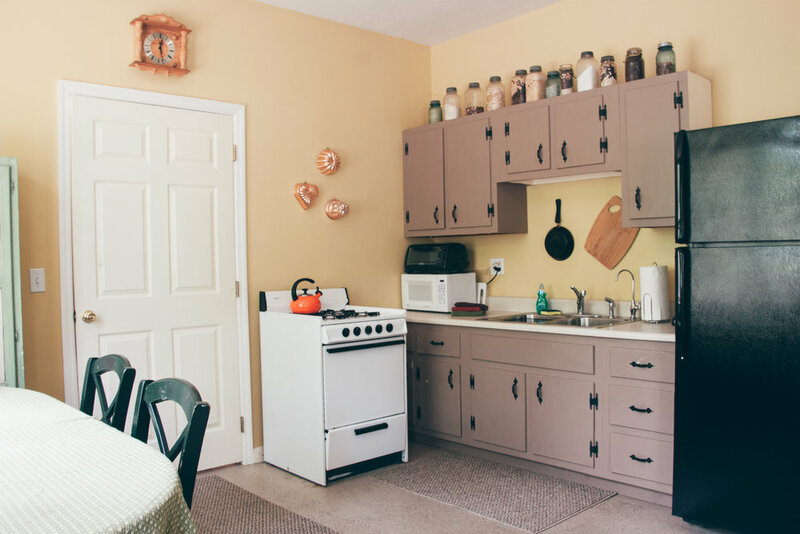 Full kitchen, comfortable sleeping for couples and groups alike and all on 60 private acres at Wellnesste Lodge in Central New York. You need a vacation! Come enjoy the Adirondack cabin at Wellnesste Lodge, NY. Upstate New York offers outdoor fun and adventure. At Wellnesste Lodge we offer 60 private acres so you can "chill" on site or go out and explore as much as you want. This cabin offers modern comfort with a traditional Adirondack look and feel. It consists of approximately 1,500 square feet of living space to enjoy. The cabin is split into two sides with a large bedroom, living room, kitchen and dining room on one side and great room/ rec room on the other. A large bathroom with an oversized walk-in shower provides for all Adirondack guests. The great room is finished in knotty pine and has cathedral ceilings, sitting areas and foosball table. There is also a large wet bar with stools which is a popular place for everyone to gather for drinks or to share a meal. Above the bar is an enclosed loft that sleeps four. 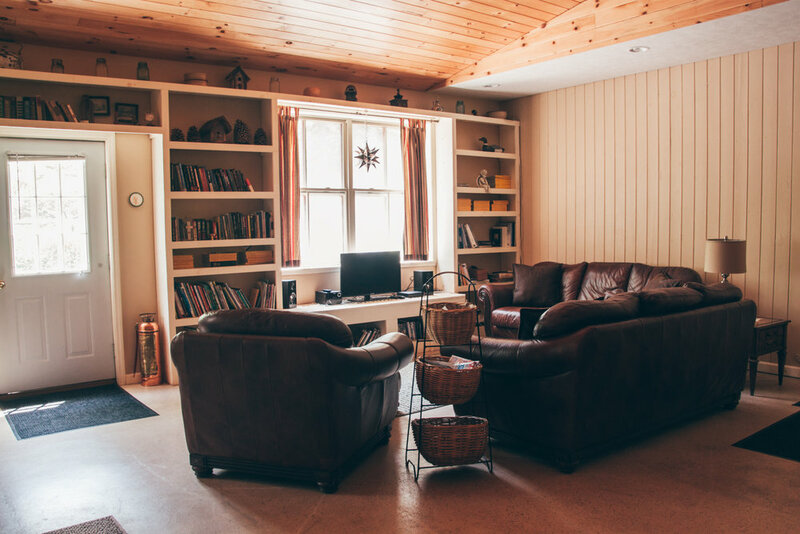 In addition, this cabin has floor to ceiling book shelves which have lots of fun reading for guests of all ages as well as a nice variety of board games for everyone to enjoy. Amenities: This cabin is fully equipped with a full kitchen and bathroom, bar area that seats 6, two living room spaces with large windows and lots of natural light. There is a master bedroom and a loft above the bar. This cabin sleeps people with 2 queen size beds, 1 set of bunkbeds and a loft that sleeps 4-6 on futon matresses.